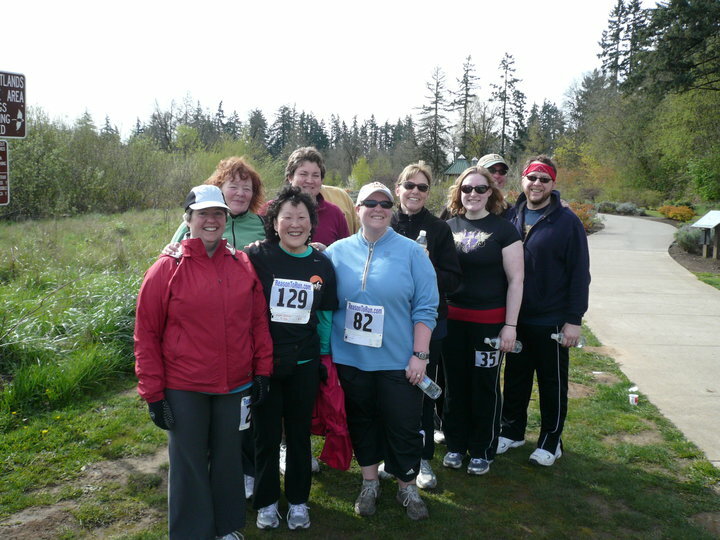 There we are - the group that ran (1) and walked (everyone else) the Spring Burst this morning. It was cold and windy - but we warmed up soon enough. This event took place in Cook Park in Tigard, just a few miles south of downtown Portland. It was nice because it was off street, some of it even on trail, with a little mud here and there (well, one big muddy spot). With part of the trail along the river. Very nice. It was also generally sunny and not a raindrop fell. I had hoped to walk the10k - that's what I signed up for. But my body had other plans, combined with the cold temperature and the wind. At one point I was going to push myself to do the 10k because, well, I thought I could and, therefore, should. I'm good at pushing myself. Which is probably one major factor in my succumbing to the illness for the past nearly four weeks. I worked out with the trainer on Thursday - the first time in a couple of weeks. She had me do cardio and advised me to see what the temperature was this morning before making my 5k/10k decision. "If it's too cold," she said, "do the 5k." So, her advice, and my lungs getting sore and tired, my hips starting to hurt (I haven't done anything over half a mile in almost a month - until Thursday with the trainer) - the wind and the just below 40 degrees : I decided to be kind to myself and turned toward the finish at the place where the 10k participants kept going. But the thought of potentially setting myself back - healthwise - for another month was enough to make me follow through. uper deal rain pants for the Grand Canyon trip (with my 2009 dividend and my member 20% off, I got these awesome pants for only $11). Of course I purchased far more than I saved on the free shipping by having them sent to the store. But most of that was on three styles of socks for walking distances. One thing with getting more fit - I've lost weight in my feet. Go figure! So now, I have to change the types of socks I'm wearing. Which is fine - now I need to find a new favorite style that is anti-blistering and cushioned! Especially since I have some ideas up my sleeves which involve walking and/or hiking and writing!